The Bankruptcy Code, which is listed in the United States Code as Title 11, has undergone various amendments since its enactment. The Bankruptcy Code ensures a well laid out legal procedure to deal with the debts of both individuals and businesses and forms a common federal law to govern all bankruptcy cases. Typically a major part of the bankruptcy processes is carried out away from the courthouse and the debtor need to appear only once for the trustee’s meeting, which is not in a court room. The present bankruptcy law, which came into effect in 2005, offers ample opportunities for the general public to rebuild a credit score and ensure a stable future. In the current economic down turn, bankruptcy has become a common issue as people grapple with various issues such as massive layoffs, hospitalization expenses, or factors not in their control. In the current year, it is expected that over 1,500,000 Americans might be going through bankruptcy procedures. Though bankruptcy continues to be a dreadful choice for many, in reality it is a safe and legal way to start rebuilding credit history and begin again. People burdened with debts may find bankruptcy a superlative option for putting things back in order. There are many advantages for those who have decided to file relief under the Bankruptcy Code. Filing for bankruptcy automatically relieves obligation from paying off debts such as credit cards, unsecured loans, hospital bills, and certain types of taxes. In most cases school loans are not dischargeable. Debtors also have the option of reorganizing car (and other types of loans secured by personal property) which the debtor wishes to keep after bankruptcy filing, making payments more manageable. Another benefit of filing for bankruptcy is the automatic stay on law suits, repossessions, foreclosures, IRS seizures, etc., which also prevents creditors from harassing borrowers for debt collection. 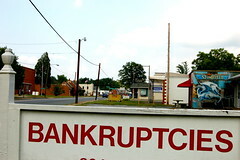 In the event of bankruptcy cases, the borrower also obtains a respite from eviction from a past mortgage. Lastly, you can prevent a driver’s license from being taken away for any unpaid bills resulting from a car accident. Often people end up in bankruptcy as they wait until foreclosure, which might leave them with little time to react and salvage the situation. If you have defaults of more than three months, or you have dues in the form of enormous medical bills, it is high time you take stock of your finances and avail professional help to set things in order. Timely intervention could go a long way in avoiding hard hitting measures such as bankruptcy, which may cost you your home! Post a Comment to "Everything You need to Know about Consumer Bankruptcy"